It was on June 16, 1675, that the last of the grand revelations relative to the Sacred Heart took place. It was to close the cycle of those solemn disclosures. Until then the humble virgin had received from the Lord only personal favors, very like those with which other holy souls had already been favored. He had only demanded of her some individual practices of devotion. Now however, the hour was come for Him to invest her with her grand, public mission. During the octave of the feast of the Blessed Sacrament, June 16, 1675, Margaret Mary was on her knees before the choir-grate, her eyes fixed on the tabernacle. She had just received "some of the unmeasured graces of His love". We have no particulars of these graces. "Behold", said He to her, "this Heart which has so loved men that it has spared nothing, even to exhausting and consuming itself, in order to testify its love. In return, I receive from the greater part only ingratitude, by their irreverence and sacrilege, and by the coldness and contempt they have for Me in this sacrament of love. What is most painful to Me," added the Savior, in a tone that went to the Sister's heart, "is that they are hearts consecrated to Me"
Then He commanded her to have established in the Church a particular feast to honor His Sacred Heart. "It is for this reason I ask thee that the first Friday after the octave of the Blessed Sacrament be appropriated to a special feast, to honor My Heart by communicating on that day, and making reparation for the indignity that it has received. And I promise that My Heart shall dilate to pour out abundantly the influences of its love on all that will render it this honor or procure its being rendered". "I no longer take pleasure in perishable food or in the delights of this world. I want only God's bread, which is the Flesh of Jesus Christ, formed of the seed of David, and for drink I crave His Blood which is love that cannot perish." "Be careful, therefore, to take part only in the one Eucharist; for there is only one Flesh of our Lord Jesus Christ and one cup to unite us with His Blood." "I am God's wheat and shall be ground by their teeth so that I may become Christ's pure bread." "It would have been well if I had learnt from Father Jogues the manner of praying and making thanksgiving (after Mass) as from a soul, if I can use the phrase, glued to the Blessed Sacrament. It was before this hidden God that he performed all his spiritual exercises, his prayers, his breviary, and he did not mind the bitterness of the cold nor the annoyance of the insects." When St. Isaac Jogues became the first white man to see the modern day Lake George in the Adirondack Mountains on Corpus Christi, he called the lake "Lake of the Blessed Sacrament." Of St. Rene Goupil, St. Isaac Jogues writes: "We begged God to accept our lives and our blood and unite them to His life and His blood for the salvation of these tribes," and "It was the Feast of St. Michael, September the 29th, 1642, that this angel in innocence and martyr of Jesus Christ, Rene Goupil, gave his life for Christ who has offered His life on the cross for him." Of her First Communion, in which Therese received Love Himself personally for the first time, she writes, "It was a kiss of love, I felt myself loved, and I replied, I love You and I give myself to You forever." In her little notebook Therese wrote down all the days on which she received Jesus in Holy Communion. Her second meeting with Jesus was equally as intimate. Of this wedding Therese recalled the words of St. Paul, "It is no longer I who life, but Christ who lives in me" (Gal. 2:20). "Perpetual Adoration of the Blessed Sacrament is the Solution to our problems of declining vocations." "It is there in His Eucharist that He says to me: 'I thirst, thirst for your love, your sacrifices, your sufferings. I thirst for your happiness, for it was to save you that I came into the world, that I suffered and died on the Cross, and in order to console and strengthen you I left you the Eucharist. So you have there all my life, all my tenderness.'" "Before the coming of Jesus Christ, men fled away from God and, being attached to the earth, refused to unite themselves to their Creator. But the loving God has drawn them to Himself by the bonds of love, as He promised by the prophet Osee [Hosea]: "I will draw them with the cords of Adam, with the bonds of love" (11:4). These bonds are the benefits, the lights, the calls to His love, the promises of Paradise which He makes to us, but above all, the gift which He has bestowed upon us of Jesus Christ in the Sacrifice of the Cross and in the Sacrament of the Altar..."
"Our Lord in the Blessed Sacrament has His hands full of graces, and He is ready to bestow them on anyone who asks for them,"
"Nowhere does Jesus hear our prayers more readily than in the Blessed Sacrament,"
"Let us go with confidence to the throne of grace that we may obtain mercy and find grace,"
Since Christ Himself said in reference to the bread: "This is My Body," who will dare remain hesitant? And since with equal clarity He asserted: "This is My Blood," who will dare entertain any doubt and say that this is not His Blood?... You have been taught these truths. Imbued with the certainty of faith, you know that what seems to be bread is not bread but the Body of Christ, although it seems to be bread when tasted. You also know that what seems to be wine is not wine but the Blood of Christ although it does taste like wine. "Neither theological knowledge nor social action alone is enough to keep us in love with Christ unless both are proceeded by a personal encounter with Him. Theological insights are gained not only from between two covers of a book, but from two bent knees before an altar. The Holy Hour becomes like an oxygen tank to revive the breath of the Holy Spirit in the midst of the foul and fetid atmosphere of the world,"
"The Eucharist is at the very center of our life; such was the teaching of Jesus. When commenting on the miracle of the multiplication of the loaves He told His apostles that He Himself is the Living Bread that came down from heaven. He called on the twelve for an act of faith and it was Peter who answered in the name of all: 'Lord, to whom shall we go? You have the words of everlasting life. We have come to believe and know that you are the Holy One of God' (John 6:69). Christian faith is faith in the Eucharistic Christ." "The Sacrament of the Body of the Lord puts the demons to flight, defends us against the incentives to vice and to concupiscence, cleanses the soul from sin, quiets the anger of God, enlightens the understanding to know God, inflames the will and the affections with the love of God, fills the memory with spiritual sweetness, confirms the entire man in good, frees us from eternal death, multiplies the merits of a good life, leads us to our everlasting home, and re-animates the body to eternal life,"
"Ask Jesus to make you a saint. After all, only He can do that. Go to confession regularly and to Communion as often as you can,"
"Salvation is from our God...on the throne, and from the Lamb!" This is the same Jesus Whom "everyone in the crowd was trying to touch...because power came out from Him that cured them all." ...From the Lamb flows a river of grace which heals every nation. Each time we look upon Jesus in the Blessed Sacrament, He raises us up into deeper union with Himself, opens up the floodgates of His merciful love to the whole world, and brings us closer to the day of His final victory "where every knee will bend and proclaim Jesus Christ as Lord". "The reign of God is already in your midst." The coming of Jesus to us in the Eucharist is assurance of His promise of final victory: "BEHOLD, I COME TO MAKE ALL THINGS NEW." Our Lord told St. Gertrude the Great that this prayer would release 1000 souls from purgatory every time it is said. The prayer was extended to include living sinners as well. "By His Eucharistic presence, Christ dwells in our midst. Out of love He has enriched the Church with His unceasing presence. As God in former days dwelt in the temple of Jerusalem, He now lives in our churches and chapels. He invites us to remain in close contact with Him. Through Eucharistic adoration we concentrate our attention on Him as we yield to the fascination of His invisible gaze. Opening our heart, we entrust all our petitions to Him,"
"[It is appropriate that the Body and Blood of Christ be truly present in this Sacrament] because of the perfection of the New Covenant. The sacrifices of the Old Covenant contained the true sacrifice of Christ's Passion only in symbol. ...Therefore it was necessary that the sacrifice of the New Covenant, instituted by Christ, have something more, namely, that it contain Christ Himself who has suffered and contain Him not only in symbol but in reality." We are made partakers of the Body and Blood of Christ, not as taking common flesh, nor as of a holy man united to the Word in dignity, but the truly life-giving flesh of the Word Himself. The Eucharist is both a Sacrifice and Sacrament. Does not nature itself have a double aspect: the sacrifice and the sacrament? The vegetables which are served at the table, the meat which is presented on the platter, are the natural sacraments of the body of man. By them he lives. If they were endowed with speech, they would say, "Unless you have communion with me, you will not live." But how do they come to be our sacrament if it was not by sacrifice? Did not the vegetables have to be pulled up by their roots from the earth, submitted to the law of death, then pass through the ordeal of fire, before they could become the sacrament of physical life or have communion with the body? "...St. John Chrysostom, who, as you know, treated of the eucharistic mystery with such nobility of language and insight born of devotion, instructing his faithful on one occasion about this mystery, expressed these most fitting words: "Let us submit to God in all things and not contradict Him, even if what He says seems contrary to our reason and intellect; rather let His words prevail over our reason and intellect. Let us act in this way with regard to the (eucharistic) mysteries, looking not only at what falls under our senses but holding on to His words. For His word cannot lead us astray." The scholastic Doctors often made similar affirmations: That in this sacrament are the true Body of Christ and His true Blood is something that "cannot be apprehended by the senses," says St. Thomas, "but only by faith which relies on divine authority. This is why, in a comment on Luke, 22,19: ('This is My Body which is given for you'), St. Cyril says: 'Do not doubt whether this is true, but rather receive the words of the Savior in faith, for since He is the truth, He cannot lie.'" Thus the Christian people, echoing the words of the same St. Thomas, frequently sing the words: "Sight, touch, and taste in Thee are each deceived, the ear alone most safely is believed. I believe all the Son of God has spoken-than truth's own word there is no truer token." 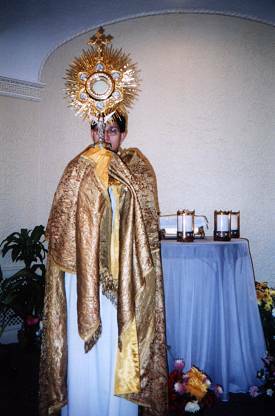 In fact, St. Bonaventure asserts: "There is no difficulty about Christ's presence in the Eucharist as in a sign, but that He is truly present in the Eucharist as He is in heaven, this is most difficult. Therefore to believe this is especially meritorious." Moreover, the Holy Gospel alludes to this when it tells of the many disciples of Christ who, after listening to the sermon about eating His Flesh and drinking His Blood, turned away and left Our Lord, saying: "This is strange talk, who can be expected to listen to it?" Peter, on the other hand, in reply to Jesus' question whether also the twelve wished to leave, expressed his faith and that of the others promptly and resolutely with the marvelous answer: "Lord, to whom should we go? Thy words are the words of eternal life." "The faithful are to hold the Eucharist in highest honor, taking part in the celebration of the Most August Sacrifice, receiving the sacrament devoutly and frequently, and worshiping it with supreme adoration; pastors, clarifying the doctrine on this sacrament, are to instruct the faithful thoroughly about this obligation." "On the altar you are looking at the same thing as you saw there last night. You have not heard, however, what this is, what it signifies, or about the greatness of the reality of which it is a sacrament. Your eyes are looking at bread and cup. This is the evidence before your physical sight. But your faith must be instructed concerning it- this bread being Christ 's Body and the cup containing His Blood. Though perhaps these words may be enough to initiate faith, faith must be further instructed in accordance with the Prophet's words: 'Believe that you may understand' ( Is 7:9). "The Eucharist is the supreme proof of the love of Jesus. After this, there is nothing more but Heaven itself,"
"In the presence of Jesus in the Holy Sacrament we ought to be like the Blessed in heaven before the Divine Essence,"
..."Can you feel the fragrance of Paradise which diffuses Itself from the Tabernacle?,"
"The faith of the Church is this: That one and identical is the Word of God and the Son of Mary Who suffered on the Cross, Who is present in the Eucharist, and Who rules in Heaven,"
"Jesus, Food of strong souls, strengthen me, purify me, make me godlike,"
"It is for us that, during eighteen hundred years, our divine Saviour has remained day and night on our altars, that we may have recourse to Him in all our needs; and nothing so much afflicts His divine Heart as our ingratitude for such a favor, and our neglect to visit Him and ask His blessing. If we knew how profitable those visits are, we should be constantly prostrate before the altar. The Saints understood this truth; they knew that Jesus Christ is the source of all grace, and whenever they encountered any difficulty or wished to obtain any particular favor, they ran to Jesus Christ in the Blessed Sacrament. St. Francis Xavier, St. Francis Regis and others spent whole hours during the day and, frequently, a great part of the night at the foot of the altar; it was in these long interviews with Jesus Christ that they advanced the good works they had in hand, converted sinners, and obtained success in all their undertakings for the glory of God and their own sanctification,"
"My heart feels as if it were being drawn by a superior force each morning just before uniting with Him in the Blessed Sacrament. I have such a thirst and hunger before receiving Him that it's a wonder I don't die of anxiety. I was hardly able to reach the Divine Prisoner in order to celebrate Mass. When Mass ended I remained with Jesus to render Him thanks. My thirst and hunger do not diminish after I have received Him in the Blessed Sacrament, but rather, increase steadily. Oh, how sweet was the conversation I held with Paradise this morning. The Heart of Jesus and my own, if you will pardon my expression, fused. They were no longer two hearts beating but only one. My heart disappeared as if it were a drop in the ocean,"
"The Saints, being far advanced in the practice of love, were faithful and ardent adorers of Jesus in the Blessed Sacrament. Importantly, Eucharistic adoration has always been considered as the closest likeness we have to the eternal adoration which will make up our whole paradise. The difference lies only in the veil which hides the sight of that divine Reality of which faith gives us unwavering certainty." "Adoration of the Blessed Sacrament has been the fervent devotion of the Saints. Their adoration lasted hours and hours, sometimes whole days or nights. There 'at Jesus' feet' like Mary of Bethany (Luke 10:39), keeping Him fond and intimate company, absorbed in contemplating Him, they surrendered their hearts in a pure and fragrant offering of adoring love,"
Pope Gregory XV said that St. Teresa of Avila "saw Our Lord Jesus Christ, present in the Host so distinctly with the eyes of her spirit that she said she did not begrudge the happy lot of the Blessed who behold the Lord face to face in heaven." 'Worthy is the Lamb to receive honor, glory and praise.' (Rev. 5:12). Perpetual adoration is the divine romance between Jesus and His people. It is saying 'yes' to His marriage proposal. All He wants is our love. 'For it is love I desire, not sacrifice.' (Hosea 6:6). Then, He will surprise us with the inheritance of His Kingdom!" "Go with Him, as His inseparable companion, to the wedding feast of Cana, and drink of the wine of His blessing. Let you have ever before you the Face of the Lord, and look upon His beauty, and let your earnest gaze turn nowhere away from His most sweet countenance. Go before Him into a desert place and see the wonder of His works, where He multiplied in His own Holy Hands the bread that sufficed to feed a great multitude. Go, my brother, go forward, and with all the love of your soul follow Christ wherever He may go... "And lovingly behold Him as taking bread into His hands, He blesses it, and breaks it, as the outward form of His own Immaculate Body; and the chalice which He blessed as the outward form of His Precious Blood, and gave to His Disciples; and be you also a partaker of His sacraments,"
"The Eucharist is the link that binds the Christian family together. Take away the Eucharist and you have no brotherliness left,"
"Jesus healed ten lepers. Only one came back to give Him thanks for the miracle of a clean body. Jesus said: 'Were not all ten made whole? Where are the other nine?' Every Sunday Jesus performs a far greater miracle for us. The gift of the Holy Eucharist makes us immortal with divine life. Each communion will leave our soul everlastingly more glorious and beautiful in heaven. In spite of the fact that Jesus asks us to give thanks for this great gift by coming back during the week and visiting Him in the Blessed Sacrament, only a very few do. Your sacrifice will make up for the ingratitude of 'the other nine,' for the many who never think of visiting Him at all,"
"Give thanks therefore to God the Father for having given you His divine Son not only as Brother in the Incarnation, as Teacher of truth, and as Savior on the Cross, but especially as your Eucharist, your bread of life, your heaven already begun." "Thank the Holy Ghost for continuing, through the priests, to produce Him daily on the altar, as He did the first time in Mary's virginal womb." "Let your thanksgiving ascend to the throne of the Lamb, to the Hidden God as a sweet-smelling incense, as the most beautiful hymn of your soul, as the purest and tenderest love of your heart." "Thank Him in all humility of heart, like Saint Elizabeth in the presence of Mary and the Word Incarnate; thank Him with the vibrant ardor of Saint John the Baptist when he felt the closeness of his divine Master, hidden like himself in His mother's womb; thank Him with the joy and generosity of Zacheus when he received the visit of Jesus in his house; thank Him with the Holy Church and the heavenly court." "In order that your thanksgiving may never cease and go on forever increasing, do what is done in heaven. Consider the goodness, the beauty ever old and ever new of the God of the Eucharist, Who for our sake is consumed and reborn without ceasing on the altar,"
"We come here to meet the Heart of Jesus pierced for us, from which water and blood gush. It is the redeeming love, which is at the origin of salvation, of our salvation, which is at the origin of the Church. Now still, today, the living Christ loves us and presents his heart to us as the source of our redemption... We are called not only to meditate and contemplate on this mystery of Christs love; we are called to take part in it. It is the mystery of the Holy Eucharist, the center of our faith, the center of our worship of Christs merciful love manifested in his Sacred Heart, a mystery which is adored here night and day. In the Holy Eucharist - this is also the meaning of perpetual adoration - we enter the movement of love from which all interior progress and all apostolate efficacy springs,"
From the Holy Fathers address at the Basilica of Montmartre in 1980, where he spoke of the Sacred Heart of Jesus in the Most Blessed Sacrament Who has been perpetually adored there for more than one hundred years. in this Sacrament of Himself. to offer you companionship and consolation. thank Him in union with all the saints. He imposes on Himself in His sacramental state. so as not to dazzle and blind you. so as not to discourage us in our weaknesses. the strength and tenderness of it. like a ray of sunshine through a thin cloud. "O marvelous Sacrament! How can I find words to praise you! You are the life of the soul, the medicament healing our wounds, our comforter when we are overburdened, the memorial of Jesus Christ, the proof of his love, the most precious precept of his testament, our companion in the pilgrimage of life, the joy sustaining us in our exile, the burning coal kindling the fire of divine love, the instrument of grace, the pledge of eternal bliss and the treasure of Christians,"
"The Eucharist is a fire which inflames us,"
"From the Eucharist comes strength to live the Christian life and zeal to share that life with others,"
"I try to rekindle the fire of the Holy Eucharist,"
"The purpose of exposition [of the Blessed Sacrament] is not only to awaken a sense of wonderment and adoration as we dwell on the reality of the presence of Christ before us. It also brings to mind the benefits that can be derived... it is often said today that through exposition we are exposed to the Blessed Sacrament in such a way as to receive the abundant fruits that come with the life-giving Presence of Christ given for the life of the world,"
- Rev. Roland Huot, S.S.S. "It's as if we expose ourselves to the sun and its beneficial influence." "Lord, by the words of consecration the substance of the bread and wine is converted into the substance of your Body and Blood. All powerful Lord, say over me the word which will change me into You." "The faith I have when I am in the presence of the Blessed Sacrament is so strong that I find it impossible to express what I feel... When the time comes to leave I must force myself to overcome the inclination to prolong my stay with Jesus." Because Jesus loves you infinitely, unlimited is the joy you bring to His Sacred Heart when you come to spend an hour with Him in the Blessed Sacrament. In an apparition to St. Margaret Mary Alacoque, Jesus spoke these moving words: "I have a burning thirst to be honored by men in the Blessed Sacrament." - from the flyer "Come to Me - I Wait for You in This Sacrament of Love"
"Once for all beloved children, the surest, easiest, shortest way is by the Eucharist. It is so easy to approach the holy table, and there we taste the joys of Paradise,"
"The Pope also beatified Dina Belanger because of her devotion to Jesus in the Blessed Sacrament. Jesus revealed to Dina the power of the holy hour in making reparation. One form of reparation is the ability to make up for what is lacking in the life of another. One day before her holy hour, Jesus showed Dina a multitude of souls on the precipice of hell. After her holy hour, Jesus showed the same souls in the hands of God. He told her that through holy hours of prayer a multitude of souls go to heaven who otherwise would have gone to hell as one person can make up for what is lacking in the lives of others by winning precious efficacious graces for their salvation. In other words, Eucharistic Adoration is the outpouring of God's Divine Mercy on the world!,"
- from "How One Soul Coming Before the Blessed Sacrament Can Change the World." "The Virgin shall....give birth to a Son and they shall call Him Emmanuel, a name which means 'GOD IS WITH US'." This is our joy today! Jesus chose the name 'Emmanuel' BECAUSE OF HIS INFINITE DESIRE TO DWELL WITH US ALWAYS IN THIS MOST BLESSED SACRAMENT, as absolute proof of HIS EVERLASTING LOVE and CONSTANT AFFECTION for each of us. Jesus calls you to be with Him today, waiting for you with great desire. "I have called you by name...because you are precious in My eyes and glorious, and because I LOVE YOU." All the love in all the world since the beginning of time is only a drop in the ocean in comparison to the love Jesus has for you alone in this Holy Eucharist, the continuation of His incarnation on earth, the fulfillment of His name: "Emmanuel, God is with us." "wholly untouched, not dug nor sown, from heaven's dew alone, it brings forth a Savior, and provides mortal men with the Bread of angels and the food of eternal life,"
"From one grain of corn which a virgin's womb brought forth an abundant harvest of faithful souls has grown all over the world,"
"O Mother of Mercy, be filled with your Son's glory, and leave what you have over to your little ones (Ps. 16:4). You are now at the table, we are dogs under the table (Mt. 15:27). Like a maid with her eyes on the hands of her mistress (Ps. 122:2) this hungry family looks to you for the food of life. Through you we have shared in the fruit of life at the table of these present sacraments. Through you may we share at the table of everlasting joys in the same fruit of life, Jesus, the blessed Fruit of your womb, to whom be honor and glory forever and ever. Amen."